I am currently attempting to type this email on the Performa 6218CD which I trustingly acquired from a local used Mac dealer two weeks ago for $450 (gasp). The package included a 28.8 modem, 15" Apple monitor, and 40 MB of RAM. To say that I wish I had stumbled on Low End Mac before that fateful decision is an understatement. I really got clipped by someone I trusted. I was thinking about an iMac, but I just didn't have the cash or patience. After reading the great article in Low End Mac thoroughly analyzing its road apple performance, I realized I had really been taken. Everything in the article has proven true - particularly on the Internet, where its lengthy processing times really destroy its usefulness. It has proven to be truly the caveat emptor Mac. I particularly appreciated the author's clear explanations of the 6200 series flaws in layman's terms and with informative detail. Right now I am getting typeahead problems writing this email. If I had just known about your site before plunking down the cash - but I didn't do my homework. No excuses. I think it was the features (CD-ROM, floppy, color monitor, and decent amount of memory) that persuaded me to make the purchase. I knew nothing about the Sculley design, multiple clock speeds, etc. A 6100 or any other PowerPC in the Performa series would apparently have been a better buy. I guess I am most disappointed in the seller - a local person who deals in used Macs I had dealt with before on an SE/30. Why didn't he point me toward one of the other Performa PowerPCs, or at least point out the problems I might encounter when using the machine for the applications I mentioned to him - Internet, etc. The machine is a poor performer - but particularly a bad joke on the Internet. I can type in a destination, go out to lunch or dinner, come back, and it still isn't on the screen. Usually I get an Error 11 or some other all purpose error code. The machine locks up, and I have to reboot. I have tried repartitioning the memory and other possible fixes, but I guess it is all of those processing cycles the machine is running through plus the slow/multiple bus speeds mentioned in the article. What Mac and configuration would you suggest as a good present day value. Can I possible salvage this machine to use on the Internet, or is that impossible. If not, I have vowed to take my loss on this fiasco and start saving for a good used machine to replace it based on what I have learned from the great articles on this site. I will probably donate this rig to a local school/church for their students to use. Thank you for any suggestions/help you might provide! I'm sorry to hear about your purchase. Manuel Mejia forwarded this to me, since he has no experience with this series of Macs. I have a little - very little. But I'm the one who posted Scott Barber's technical article on the "x200 series" and then adapted it for the layman in the Road Apple section. The good news is you've found Low End Mac and learned that even Apple can make the rare dog of a computer. (My apologies to dogs everywhere for that remark.) And of the handful of compromised Macintosh designs, the x200 series was the worst. All those unexpected symptoms you described were the reason Scott Barber dug to the bottom of the problem. If it's any consolation, in an average month over 1,000 people read that page and are warned away from the 5200-5300 and 6200-6320. Still, it's not common knowledge how poorly these models perform. Your local dealer may not have been aware of these issues. Give 'em the benefit of the doubt and see if they'll give you a generous credit on something else. If I were buying a used Mac on a tight budget, my first choice would be a Power Mac 7500 or a comparable clone, such as the SuperMac J700. These models accept a CPU daughter card, so even if you start out with a 100 MHz 601 processor, you have the option of replacing it with a faster 604, G3, or even G4. For the record, we have three SuperMacs at home. My J700 started out at 180 MHz and cost me $800 on close-out. It now runs a 250 MHz G3. My S900 came bare-bones from Small Dog for about $300, then required a video card, CD-ROM, hard drive, and more. It now has a G3/333 card and probably cost me under $800. Finally, my oldest son has a S900/200 we picked up used for a song - my local Apple dealer keeps his eyes open for things like that. It's now running a G3 card a 372 MHz. Upgrades are easy and relatively inexpensive these days. Know the price range. Check eBay, AuctionMac, Small Dog, MacResQ, and Urban Computer. We recently picked up a 7600 with a 132 MHz 604 processor, 32 MB of memory, and a 2 GB hard drive for work at $450 from Urban, a deal I still see listed on their site. Since you already have a monitor, keyboard, and mouse, that could be the kind of deal you're looking for. Third choice would be a 6100, particularly the 6100av, which can be hard to find. It's not very fast, not very expandable, not very powerful. Count on outgrowing it within a year or so - but you can often find them for under $100. At that price, it doesn't hurt to buy a computer you'll outgrow. If you can find good prices, you might also want to consider the Performa 6360 (a whole different motherboard than the x200 series). You already know the worst Road Apples. Add the Power Mac 7200 to your list; there is no way to upgrade it short of replacing the motherboard and buying a daughter card - which will cost more than a used 7500! If you do elect to buy from an auction site, don't let yourself get carried away. If it goes over your budget and over a realistic price, let someone else buy it. There are plenty of good used Macs out there. I know; I've acquired a nice collection over the years. Thank you for your helpful and sympathetic response! In spite of the deficiencies of the 6200 series, I have come to grips with my mistakes and have decided to make the best of it. That being said, I purchased a SCSI Zip drive and an external 56k 3Com modem - both of which seem to be functioning properly at present. As was mentioned in one of the excellent articles on Low End Mac, I did have to remove the Global Village 28.8k modem which was installed. Thanks to a book which I also purchased, "Upgrading Macs," this wasn't too big of a problem. I carefully slid the logic board out just enough to expose the GV modem and lifted it out carefully (wearing a grounded wrist strap at the time). Amazed I had the courage to try it. Then buttoned the machine back up and fired it up. I am currently using AOH (America on Hold) as my ISP, so I used its settings to install the new modem. 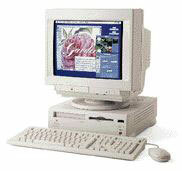 At first I used the Concentrix CD-ROM that comes with the modem and installed Netscape Navigator. I believe I goofed on this, as I didn't really understand what I was doing and why (dangerous habit), and then I removed it. Fortunately I had the system file protected at the time, so it was just a case of dragging the application to the Trash (I hope). I love Macs, and although disappointed in my hasty and erroneous choice of the 6218, I am learning a lot about the machine thanks to your great website. Thanks again for your detailed and knowledgeable advice and wealth of useful information. P.S. The 56k modem seems to speed things up a bit on the downloads, as before I was selecting a site destination, eating lunch, coming back, and it still wasn't up on the screen.